Being a Montessori homeschooler can be expensive. Luckily, there are free Montessori albums for Elementary 6-9 to download! Check out my free downloads too. A while ago I had found some Montessori albums for 6-9 online but it looks like the site is gone. I don’t know what happened but they were available as a free download so I don’t think there would be an issue with providing the albums since we all know I didn’t make them or buy them and the link has gone all screwy-looie. Well, enjoy the free Montessori Album downloads!. 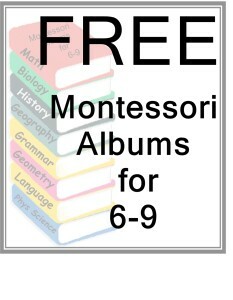 I hope you and your homeschool kids enjoy these free Montessori albums for Elementary 6-9. Don’t forget the free Montessori Elementary material downloads I have either. Well, I have mixed feelings…I am so glad that people are finding the albums useful for working with their children. However, I compiled these albums for a training center where people obtaining them were training to become teachers and had to pay for them. Plus there are pages that either are copyrighted or pages that were taken from other people without their permission, that I had not originally used. They were never to be available for free without the training. It may be that a former student put them out there for everyone without first asking permission. Please respect the intellectual property and labor of those who created this material. I’ve emailed Ms. Ziegler and apologized. I never would have thought they would have been shared on such a professional looking site without the creator’s permission. The albums are being removed as Ms. Ziegler has mentioned they were not available for free without the training. My deepest apologies Ms. Ziegler. Ok…I am floored these are out there!!!!! What an amazing thing to share…these look fantastic. I cannot get any of these links to work. I tried signing up for an account and clearing the cache’ on my internet browser, but nothing is working (the files won’t open or download). Any suggestions??? Sorry for the delay Cheryl! Theyre working for me so Ive no idea why. Try again and email me if they still dont work. I am not very techie and was confused by the pop up box to subscribe to Box. You don’t need to sign up for box. When you click download check your download file. I was able to transfer them over to another folder on my desktop. I’m the former owner of Montessoritweens yahoo group. I’m glad you have these archived, so our (former) members and others can have a new reference point for free LE albums. You are in the clear as to rights for posting. As anyone who actually READS these albums will discover, they are mainly compilations of other people’s work. An even closer look will uncover the way they were converted to pdf (from scanned documents). One reference is made within the Grammar album to JMJ Publishing (one of our homeschooling colleagues). If she is not upset, girl, you’re okay! Christmas LOVE to you and yours, and to your following! Thank you! I found these linked through The Organized Classroom Blog. What a find! You’re welcome Marie and everyone else! I like the albums a LOT! They’ve been very helpful to me and my children. If anyone finds a link to some 9-12 albums I’d appreciate if you’d send the link or even the dl’s if they’re yours to me here. Thank you so much for sharing these files. I found the link a couple of months ago but didn’t download them as I thought I could go back and download them later. I was so upset when I found the site down. And thank you for all the other downloads on your site, I am excited to use them in my classroom. I’m really grateful for you sharing this albums! There is actually a botony section in one of the downloads above. I’m thinking it was in the biology section. are you aware of any botany albums online? Thanks. Thanks! I feel like I’ve died and gone to heaven! I found your blog through a yahoo group, and I’m just so happy I did. I really appreciate your efforts in sharing these files with us. I started saving them but before I could finish with all the albums the link went down. Many thanks to the creators of the albums as well. I am grateful to you for uploading these files. I had saved that link in my favourites hoping to download it sometime and when I actually wanted the files the website was not functional.I felt so bad as I had really liked the album. Also since the files were available for free download I don’t think putting them up on your blog should matter as it will help many other people like me. Thank u once again . I appreciate the efforts to repost these. I have them saved, and can print as needed. Thank You! I would see how it’d be poor form if I claimed these as my own, or ‘shared’ them when the link worked, or didn’t give credit where due. In my experience with file sharing there is no issue with sharing free files…only in claiming them as your own…or if they can be obtained directly from the source. And, I do not claim them as my own, the link has been down for some time, they were free, there was nothing said against sharing the albums. I wouldn’t have an issue with this. The file sharing groups I’m on follow these guidelines. I’m comfortable with my decision & if the creator of the albums would express upset I would apologize & share there was no disrespect & only the hopes of sharing the good news. I hate to be the downer here, but it’s considered poor form to share someone else’s files without their permission, even if they had them up for free.